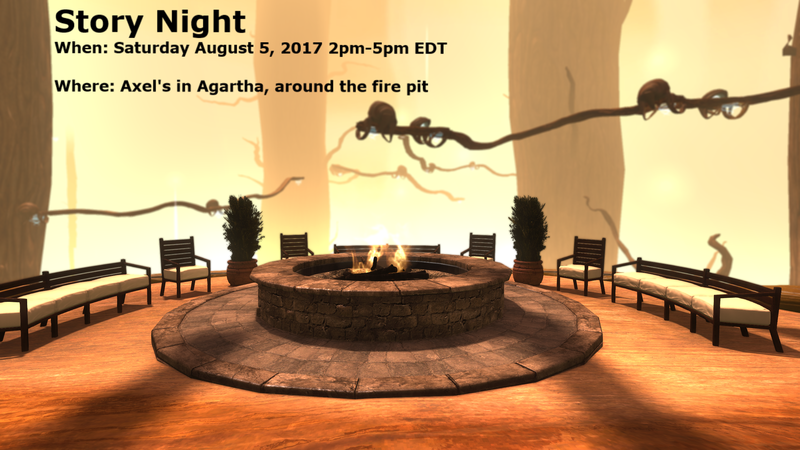 Where: Axel’s in Agartha, around the fire pit. Hello and welcome all SWL players and roleplayers! This will be the first of a monthly recurring event to encourage new roleplayers and the rp-curious and allow people who want to share short vignettes, poems, cautionary tales, original works, et cetera. A long time ago, a friend named Shaw introduced me to roleplaying in a video game by hosting a recurring Story Night, where people would gather and take turns telling short stories and tales of their adventures! People came and went and either listened respectfully or told a story to the assembled. We even had theme nights for tales of love, horror, poetry nights, etc. It was a lot of fun. I’d like to honor his legacy by starting this event in SWL. My goal is to continue to have both SWL and the wonderful roleplaying community thrive and grow, as well as have fun telling and listening to stories. I look forward to having theme nights in the months to come if this first one is a success! September should be a Lore...ahem, Legendary tale night and October will of course be tales of terror. Be respectful of the speaker who currently has the floor. Be respectful of the listeners who are trying to enjoy the speakers. The gathering is a peaceful one. There should be no open hostility. We’re all there for the same purpose. The host is there to facilitate the gathering. The speaker will change as the host gives them charge of the gathering. Try to post it in digestible blocks, about a sentence or two at a time to simulate storytelling. Give room for feedback. People like to interact in between parts of a story. Keep your story to about 10-15 minutes maximum! That way we can get several people up to speak. Remember to signal the end of the story and then please go take your seat so the Host can pick the next storyteller. I am looking forward to this gathering and I hope to see you all there! Thank you! PS- Filler picture until I get a better poster made!